Ever since I've purchased an obese rat last year, I've had problems finding the right amount of food to feed him. I don't want to feed him too much since he's obese, but I want his diet to be somewhat well rounded. Currently I just fill his bowl halfway with lab blocks every day, and he gets random tidbits of things like veggies and egg. I'm wondering if he's just depressed. He's out for around 30 minutes a day with me, so do you think he just needs more enrichment, or perhaps another rat? Or is there a way I can adjust his diet without hurting his health? He could have some underlying health condition but unless you want to spend money on lab tests and blood work it would be hard to say what. Like thyroid or adrenal issues. Ori(not a rat) was like that didn't like to play and run like normal anteater and got super fat and nothing helped all the way then she died suddenly young and it was only then I realized the other issues of being fat and "lazy" were actually signs of a problem. I think we're too conditioned to think "Fat" is always just too much food and too little exercise and it's not always. One thing you can do to make him more active is use his allotted food for enrichment. Hide the blocks around his cage so he has to run around. Maybe train him to target so you can make him run around for his food or allowed treats. Put bits of blocks in things he has to work to get them out of. Check out our enrichment forum section for more ideas. If I get a chance I can see if I can come up with some small cage pet enrichment specific things to list. Scent enrichment may help. Put some smell in the top of his cage so he has to go explore to see what it is. You didn't specify which lab blocks, but you'll want to feed a lower protein maintenence block preferably without corn or at least only a tiny amount. For older males 14% is a current recommendation, higher for younger. 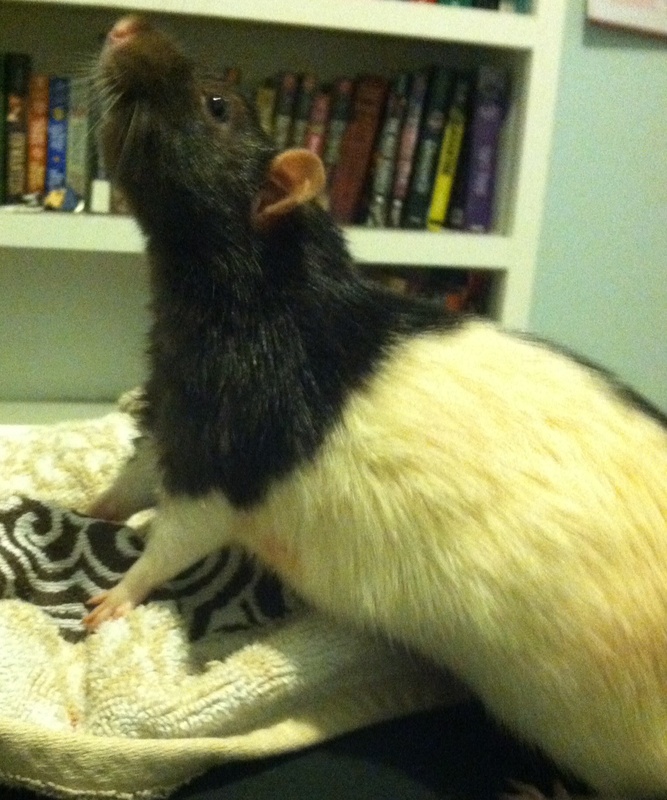 I never truly free fed (I measured) any of my rats but they did always have something available to eat. I used scatter feeding and foraging/puzzle toys. In the mornings I would scatter a grain mix and a few foragings with non perishables. In the evening when they are most active was time for fresh foods and block or pellet food. This worked for me for years. Foraging, enrichment, health were already mentioned. You didn't mention his age, but it could also be a factor if he is older. If you can, spend a little more interactive time with him. Do you play with cat feather wands or Kitten Mittens? Many rats like them. As for another rat, if he hasn't been around other rats at his age , he may not accept intruders which could result in dead rat(s), from fighting or stress. If you do try get a pair so that If you need to separate the new rat will have company and even if they did all get along and live harmoniously you won't have a single lonely rat when one died. And read all about proper introductions. Don't try to make him lose too much weight too fast. Should be gradual and steady. I wouldn't try a wheel until he's in better shape, just like an obese human shouldn't jump right into heavy exercise. I never had a rat use any type of wheel and that's not uncommon. I have heard that of those that do, a saucer type is preferred. For a traditional solid wheel make sure the size is appropriate. The rat must be able to run flat out without arching his back. Look at chinchilla wheels. Thanks for all the ideas and info, I'm going out today to buy some better food (the food I have right now is extremely high in corn and corn meal, etc) and I'll implement hiding his food in different areas of his cage, as well as anything else I can come up with. Switching foods might take a while though, he's developed a taste for unhealthy foods lately and might not take well to the taste of whatever I end up buying. Forgot to mention if he's never foraged before he may not know how. Start easy and increase the difficulty as he learns. Like leave food on the cage floor but uncovered, in a bowl partially covered with a paper towel, in a toilet parer tube but without the ends pinched shut for a first time. Here's a pic, he's actually lost quite a bit of weight already. Also being a lot more active! Pop tarts would be a big factor. Once fat an animal wont be as active which makes things worse if the calories keep coming in, in the same amounts. So glad to hear he's of the American diet and getting more active!